I’ve just returned from the latest, and sadly final, New Adventures in Web Design conference in Nottingham, and once again my Tom Bihn Western Flyer was my luggage of choice. My Western Flyer has quickly become one of my favourite, and most used pieces of luggage. I love it, and so thought I’d write a quick review to explain why I think it’s so great. These days I seem to be away for short one or two night trips more often than longer trips. I have a rather, ahem, wide range of luggage suitable for longer trips, but I was lacking a good overnight bag. 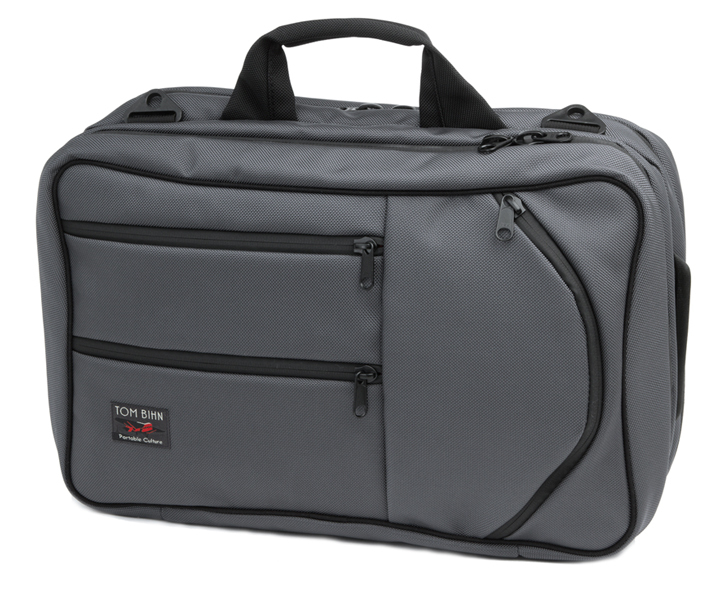 I’ve been aware of Tom Bihn bags for a while, but after seeing my friend Documentally’s great review of the Tom Bihn Tri-Star I looked again at their range. The Tri-Star is great, but larger than I needed, however it’s smaller sibling the Western Flyer looked perfect, so I took the plunge, and ordered one. I say I took the plunge, as while I believe Tom Bihn bags are good value, they are definitely not ‘cheap’. Then there is the rather high cost of shipping from the US, and the outrageous import duties charged by HMRC. Even more galling were the administration charges from UPS; tax is one thing, but charging me to pay tax is adding insult to injury. Adding all of this together makes the cost of the bag significant, so it’s just as well it’s so good – let me explain why I rate it so highly. The Western Flyer has two full-size compartments on the front and back of the bag. The front compartment can be split into two smaller sections by a zipped divider. A great and well executed idea. On the front of the bag there are three pockets; two regular zipped pockets on the left and an unusual curved pocket on the right. On the left there is one full height pocket, and one roughly half height. The intriguing right hand pocket is designed to carry a water bottle, there is a separate flap inside that can be closed with a press-stud to hold your bottle securely. I have a 500ml Sigg bottle and a 550ml Bobble Bottle, both can be comfortably zipped up completely within the pocket. In each section is a nylon O-ring to which can be clipped a range of organiser pockets from Tom Bihn; I clip my keys to one at the front. The capacity of the Western Flyer is surprising – it’s much bigger inside than it looks outside. I’m 6’ 4” and of big build so my clothes are larger than average, yet so far I’ve not needed to use more than the main section at the rear of the bag for my clothes. 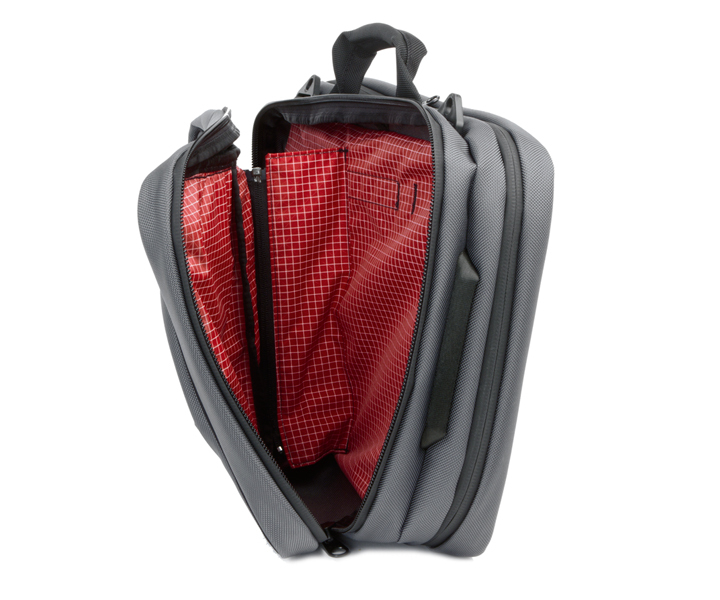 To use the bag most effectively I recommended using Tom Bihn’s packing cubes, which are zipped containers tailor made for each section of each bag. Using my packing cubes, and the bundle method of packing I can easily pack a pair of jeans, two or three shirts, t-shirts and assorted underwear. Enough for three days, and being bundled means they arrive relatively crease free. In one of the from sections I carry my wash bag, I have a great little wash bag from Muji for domestic trips or clear zipped container for when I fly. The other front section usually contains technology and related cables; my iPad easily fits, in fact an iPad will fit the taller front pocket if required. I bought in Nottingham on the other side – not a small book. With all this packed away the Western Flyer can naturally get a little heavy, and this is where another great feature of this bag comes into its own. 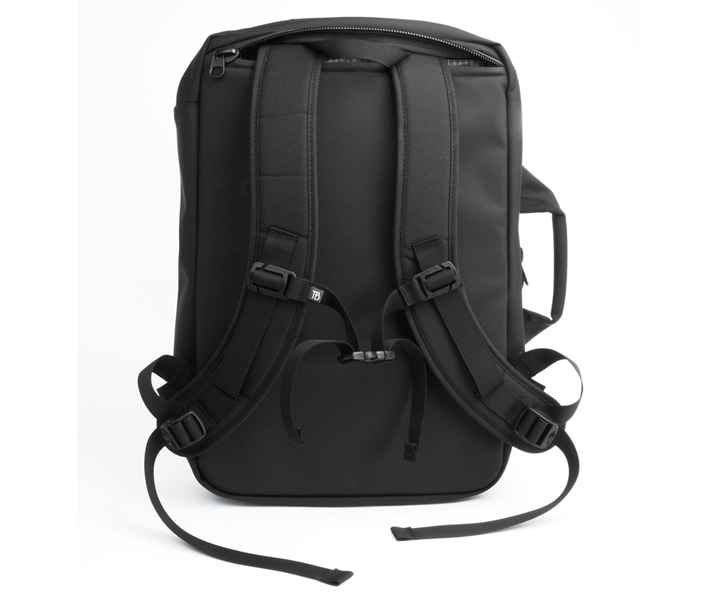 The Western Flyer has clips on top for a shoulder strap, and using Tom Bihn’s Absolute shoulder strap the bag is very comfortable to carry. But should you wish to save your back, or keep your hands free simply unzip the compartment on the rear, and deploy the excellent backpack straps hidden within. These aren’t token backpack straps, but full size padded straps complete with adjustable sternum strap. I love this flexibility and comfortable load carrying. The Western Flyer has a comfortable full-size handle on top of the bag along with slimmer handles on both ends of the bag, which means you always have a handle accessible to pick up your bag. Every part of the Western Flyer has been thought through and well designed. Every part is there for a reason, to be used, and to make the travellers life easier. The other reason I like my Western Flyer so much is its construction; this bag is going to last me years. The exterior of the Western Flyer is made of 1050 denier ballistic nylon, which apparently has twice the abrasion resistance of regular ballistic nylon. The material has a different feel to the nylon used in other bags I’ve owned; it feels softer and yet stronger. The interior of the Western Flyer is made from super light Japanese Dyneema – a rip-stop nylon made especially for Tom Bihn I believe. My bag has a striking Iberian red interior, which compliments the steel grey exterior beautifully. I normally buy black bags, but when I ordered my Western Flyer black was out of stock, as I needed the bag quickly so I went for the steel grey, and I’m really glad I did. It’s a great grey that is oddly distinctive in a sea of black bags. I love the way the black handles and zips contrast against the grey. Speaking of zips those used on the Western Flyer are amazing. Tom Bihn use YKK Aquaguard zips which have a rubber coating making them water repellent, as you close the zips the rubber coating ‘seals’ behind the zip pull. The zip pulls are nice and big making them easy to locate and use. There cord pulls you can attach to the zip pulls, but I stupidly mislaid mine, and have not been able to try them. The zips have a smooth, high quality feel as you use them – they feel like they’ll last for years. My only complaint against the zips is that the metal pulls can be rather noisy as they jingle against each other. The last part of the construction, and arguably most important, is the stitching. The design of the Western Flyer hides virtually all the stitching, but what I can see looks, to my untrained eye, perfect – uniform and well finished. So there we have my Tom Bihn Western Flyer, a beautifully and thoughtfully designed and constructed piece of luggage. I love my Western Flyer, it seems to almost have a personality such is my bond with this bag – it makes me want to pack it, and get out there and travel. I too am a fan of Tom Bihn bags but agree the cost of getting them to the UK is awful. We just had a holiday in Florida and that gave me a great opportunity to buy the aeronaut and the Synapse. Delighted with both of them and packaging $10 !!! Upon reading your brilliant review, I became interested in procuring one for travel to UAE later next month. To my immediate dismal, I am immensely disappointed with the current color selection! No red interiors available! For luggage that’s >$200, grey interior is much too…ordinary. @Jonathan I sympathise. I have a Co-Pilot on order, and really wanted it in steel/iberian, but alas it’s not a combination they produce. I’ve ordered black/steel which is the same colours as the Ristretto they sent me, nice but the iberian lining is rather great..
Where in Florida did you buy these fantastic bags ? i am from Denmark and we have same strict customs rules that you have in the UK. But I am going to Florida next year and would like to purchase a Western Flyer while I am there.